George Flavell also ran his own trip at this time. 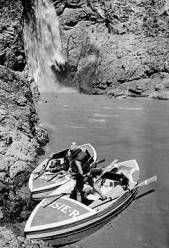 He and his brother began building a boat in August of 1896 before setting off on the Green River in October of that same year. There were no major mishaps on the trip and they arrived in Yuma in January of 1897. The trip took them a total of 65 days. All but 6 rapids were run, all without any major upsets. The actual running of the Grand Canyon from Lee’s Ferry only took them 14 days. It would take almost another 50 years for this record to be broken. Flavell’s journal of trip, titled Log of the Panthon, was found and published long after his death.